This statistic shows the number of iPod units sold worldwide by Apple from 2006 to 2014 (according to the company's fiscal year). Sales have been decreasing in recent years after peaking at 54.83 million in 2008. The first line of iPods was introduced to the market in 2001, Apple’s first foray into consumer electronics. Two years later, Apple launched the iTunes Music Store. The iPod, along with iTunes, revolutionized the music industry by offering a smooth combination of software and hardware in a pocket-sized device. With several hundred million units sold over the years, the iPod can be considered one of the company’s biggest successes. iPod sales peaked at four billion U.S. dollars in the first quarter of 2008. 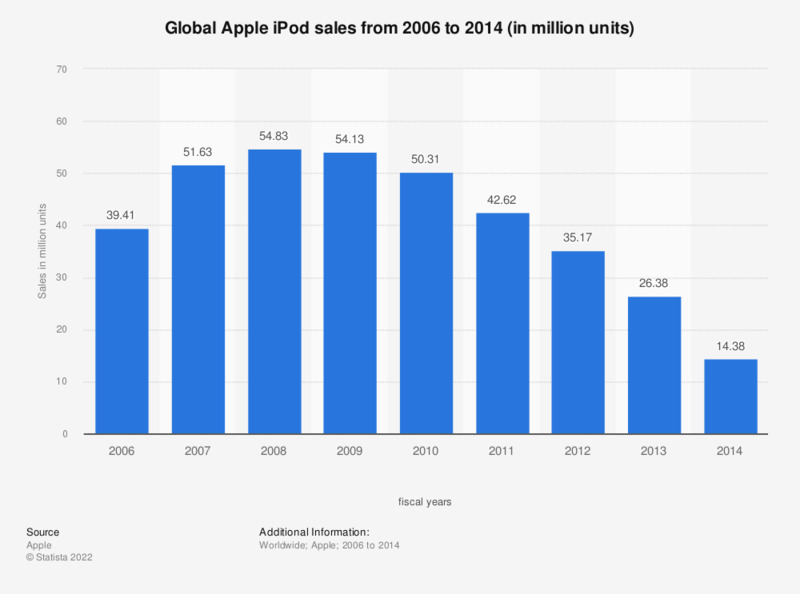 In all of 2008, a total of 54.83 million iPods were sold. With the introduction of the iPhone in 2007 and its rapid success, the share of the company's total revenue generated from iPod sales started to decrease. Up until the third quarter of 2010 though, Apple still sold more iPods than iPhones. In the last quarter of 2014, iPod sales accounted for about one percent of Apple's total revenue. At that point, iPhone sales made up more than 50 percent of Apple's revenue. The decline of iPod sales can not be attributed to the introduction of the iPhone alone, but also to the rising popularity of smartphones, with both types of devices offering similar music features. In 2008, 139.29 million smartphones were sold around the world. By 2016, this figure had increased to almost 1.5 billion. Apple's fiscal year ends in September. Everything On "iPod" in One Document: Edited and Divided into Handy Chapters. Including Detailed References.